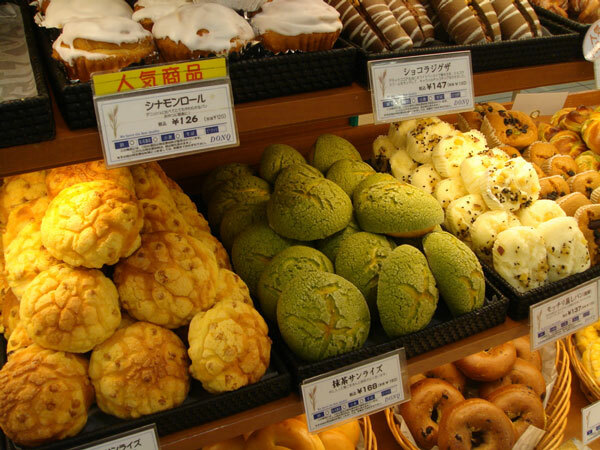 The photo above shows my take from Kimuraya: five anpan, a Danish-like pastry with green tea icing and whole beans inside and on top, and melon pan, another type of Japanese bread seen in almost every bakery. Melon pan, so named for its appearance rather than its flavor, is another sweet, soft bun crusted with cookie dough, and may include some type of filling. This one was filled with a mango custard, and quite tasty. In the basement of each and every department store are (usually two floors of) amazing food halls containing every imaginable type of edible delight: not only baked goods but produce, meats, ready-to-eat foods, packaged gift foods, and more, all beautifully displayed according to the exquisite Japanese aesthetic. 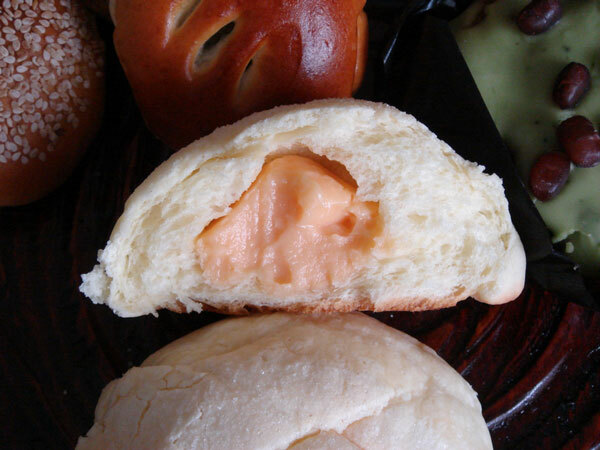 Two types of melon pan are seen in this photo, taken in one such food hall. I sampled the green one, which was filled with sweet bean paste and covered with tea-flavored cookie dough. 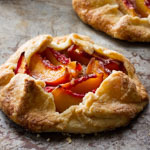 Very delicious, if a little crumbly and messy to eat. In a few hours I leave Japan… for now. I will return, to soak up more of this unique culture and perhaps learn how to bake some of these wonderful breads. I do have some recipe book in Chinese as well as Japanese, if you need anything, do let me know. Have a great trip. PS: Do you visit their baking store, they do have a huge selection. I wish I could read Japanese (maybe someday)! I did visit Kimuraya’s store; they do have quite a selection of anpan. The store is rather small in area, and was quite crowded when I went. Since I do not speak any Japanese, I had to order by pointing. As in every Japanese establishment, the people there were exceedingly polite and patient with me. The word for bread used in Japan is ‘pan’ taken from the portuguese ‘pao’ from when the Portuguese came to Japan. I am very keen to lay my hands on the recipe for the japanese bread. Can anyone help. I have tried many but with not much success. I’m Japanese and live in Japan. Yes, we have a lot of unique original bread here. And I want people in other country to know the Japanese bread. I’ve been thinking this since I started baking bread. Now bread baking is quite popular in Japan. There are a lot of bread baking studios. It’s widely spreading in Japan. And many people have own blog about bread. Chiharu, thanks for your note. 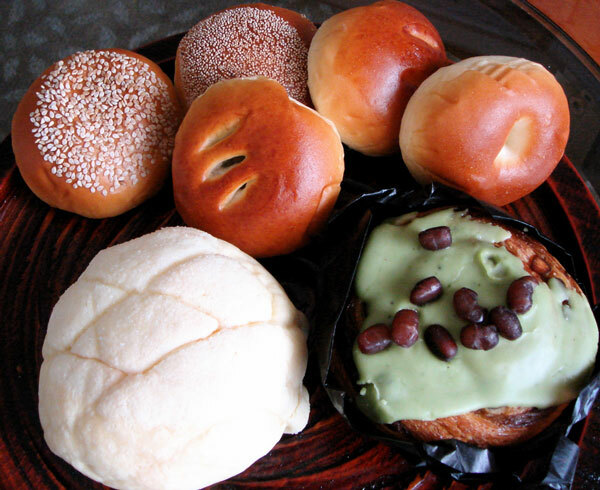 Do you know of any Japanese bread blogs or other sites that have information in English? I would like to learn more about your breads but I don’t read Japansese (or speak it either). 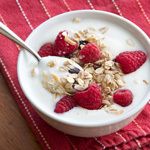 There is a blog which has some recipe in English. The address is below. When I find others, I’ll let you know. I used to live in San Francisco. I miss there!! because most of japanese bread baking book they say about this but I don’t understand japanese. I live in Okinawa, Japan working with the bases here and have not mastered the Japanese language yet. I LOVE the Japanese breads sold in the bakeries (the sliced milk or hotel breads that have an almost stringy texture when pulled apart). 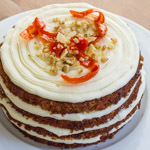 I am almost an intermediate baker but have yet to find a recipe or instructions on the technique to make it. I love the link that kim posted http://www001.upp.so-net.ne.jp/e-pan/recipe/reccipe.htm but can not read it. Does anyone know if this book or the recipes have been translated to english or where I can buy really great Japanese bread cookbooks? I might pay to have someone translate a few of the recipes. That is how much I love to bake and how much I love Japanese breads. Yes, I can just go down the street to buy it, but there is so much satisfaction to be able to make a really GREAT loaf by hand. Also, when I rotate from Okinawa, I would love to be able to have great Japanese style bread wherever or whenever I want. I use only commercial quality ingredients and King Arthur flour. Please help! If you know of any baking schools that I could go to in Okinawa while stationed here, I would love to do that also. Bingata, I wish I could help but I don’t know anything about Japanese cookbooks or baking schools. 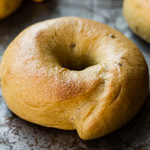 Consider posting your question at The Fresh Loaf. Thank you Susan 🙂 That is a great suggestion. 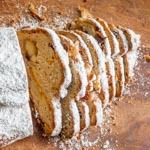 I am hoping Kim, who posted the link, reads Japanese and might be able to translate a few of the recipes or knows of another site that has true Japanese style Pain de Mie, hotel and their regular milk sandwich loaf recipes already translated into English. I translated one of the recipes via Google but the translation was off and the recipe made no sense at all. This is an old thread, but if Bingata is still around I was wondering if Giro’s bakery is still around on Okinawa? I grew up there in the 60’s (a very long time ago!) and they did American style breads and patries that were wonderful. I think they were out toward what was then called Futema housing area. HELLO ANYONE!!! 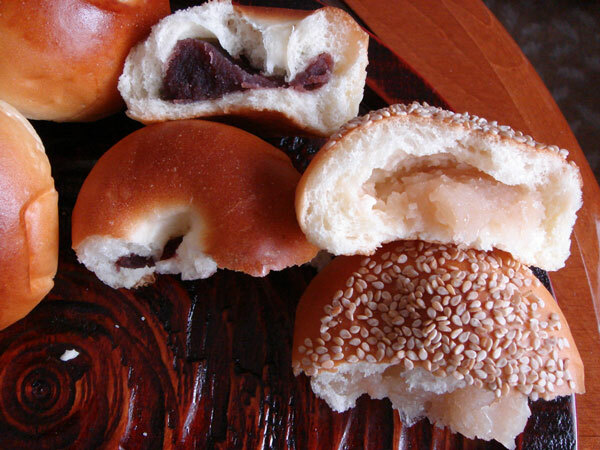 Recently I was told from a Japanese Friend that there is a bread called, “SAN SHOKU PAN” or 3 flavored bread…One consisting of pan, One consisting of custard, and one consisting of chocolate…Does anyone know of this bread or have a recipe they would like to share? Thanks!!! I am having my holidays in Tokyo . 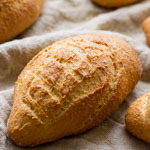 IS there any place that I can learn breadmaking ? And the class schedules too. Or any one-to-one teaching . I have only 1 week in Tokyo. I too have been keenly interested in Japanese/Asian style breads. I particularly am enjoying the Hokkaido style milk breads and Chinese Custard bread. Both are similar, but use individual approaches to starting the bread. Each uses a “paste” and the Chinese paste contains an egg along with the other ingredients. 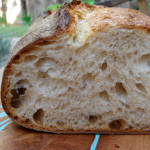 I have posted the Japanese style bread recipe and instructions on my website http://loavesandladles.com. 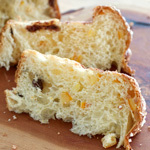 I am going to post the Chinese Custard=style loaf recipe there as well. I need to make more today so I can get more images. The technique and end result are absolutely fabulous. I hope it helps. What caused me to land here… I am looking for a Japanese bread pan for Hokkaido bread. I can, in a pinch, use an american sized loaf pan, but it does squeeze my bread a bit too much during the second rise, so I’d love to find something bigger. Oooops, I gave the wrong URL for my blog.. It’s fairly new and I haven’t been actively recruiting anyone to it.. it’s really for my own personal use, but anyone is welcome to join. While i am in Japan, i used to go in combeny store and first i bought Japanese sweet bread. i really liked to much and i missed it too…..
Howdy, I believe your web site may bbe having nternet browser compatibility issues. in I.E., it has some overlapping issues. I somply wanted to provide yoou with a quick heads up! Other thawn that, great site! I just came across this blog now and I hope Chiharu or anyone living in Japan, the Philipines or Asia generally is still here. 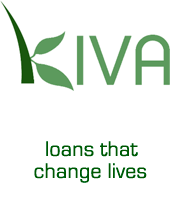 I am working on setting up a bakery in Nigeria and I will like to employ a baker who’s good with bread and another cakes. But for now, bread and donuts are the major focus.